Lecithinase test or Nagler’s reaction is a biochemical test used to identify organisms which liberate phospholipases (lecithinases) e.g. Clostridium perfringens. The alpha (α) toxin of C. perfringens has phospholipase activity and hence, helps in differentiation of C. perfringens from other Clostridium spp that also produce lecithinase (C.baratti, C.absonum, C.bifermantans, C.sordelli and C.novyi) by neutralization of lecithin c activity by an antitoxin. Bacillius cereus also exhibit strong lecithinase activity but can be differentiated by its strong hemolytic property on sheep blood agar and motility. Among bacillus species, B. thuringiensis and B.anthracis are lecithinase positive or weakly positive. B. anthracis however is a non motile organism and produces non hemolytic colonies. Bacillus sphaericus is a negative producer of Lecithinase. Principle: Bacterial lecithinase break down this lecithin (a normal component of egg yolk) to an insoluble diglycerides resulting in an opaque halo, surrounding the colony when grown on the egg yolk agar medium. Modified egg yolk agar is a differential and enriched medium used in the isolation and presumptive differentiation of different species based on their lecithinase and lipase production and proteolytic activity. The degradation of lecithin present in the egg yolk results in the formation of opaque precipitate around the colonies. The lipase enzyme hydrolyzes the fats within the egg yolk, which results in an iridescent sheen on the colony surface. Media: Basal egg yolk media is prepared by dissolving the standard amount in distilled water in which 10% egg yolk is added after autoclaving and cooling the media before dispensing into sterile petri dishes. Various modifications of the original like Modified egg yolk agar media, Mannitol egg yolk media etc are also available and can be used for specified purposes. Label and dry a egg yolk media plate and mark the plate into two halves. Inoculate 60 µl of Clostridium perfringens type A antitoxin in half of the plate, spread over the surface of agar using a spreader and allow to absorb and dry. Mark the side of the plate in which the antitoxin is inoculated. Streak the test organism in a straight line from the toxin free agar half of the plate to toxin containing side. Repeat the same procedure with control strains on the same plate. Incubate anaerobically at 35-37°C for 24-48 hrs. 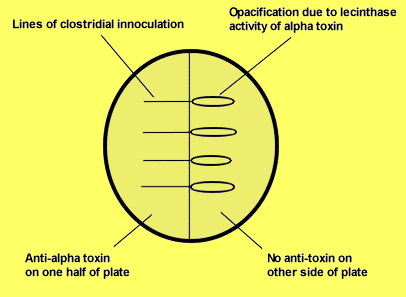 Examine the plate for an opalescent halo around the inoculum and inhibition by antitoxin. 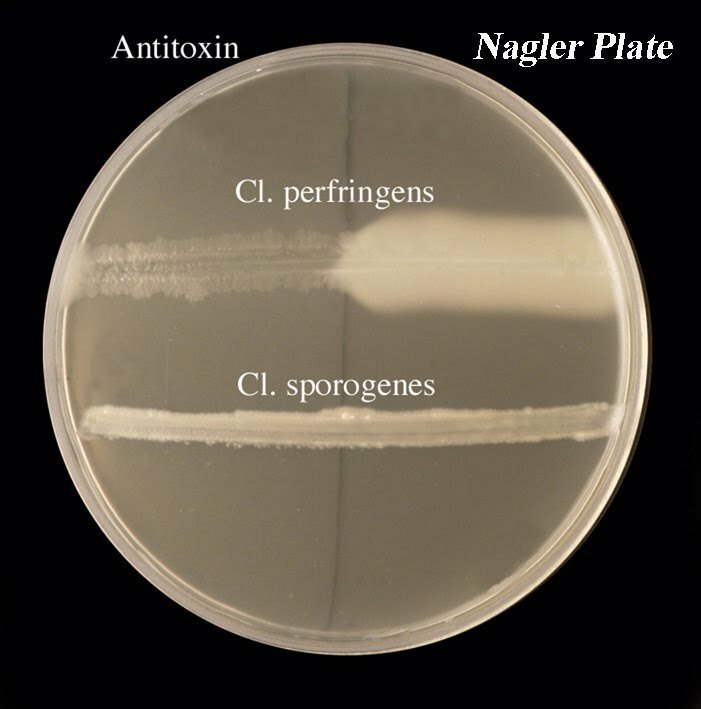 C. perfringens type A antitoxin is not specific for C. perfringens ; a positive Nagler reaction can also be produced by C. bifermentans , C. sordelli , and C. baratti if heavy inoculum are used.